It’s not a hike without some sort of complication either late in the night created by the Admiral’s excitement to “go to the mountain” or the morning phone call to the Navigator asking for help to deal with some networking and WiFi issue. The fact it was a combo of both was not surprising. At least, we got the hiccup of the hike out-of-the-way before we left the house. We headed out to the start location a bit later than planned, but it was manageable to make the summit and get to campsite one. We would arrive at the campsite at nightfall. The hike up to the campsite one was rather uneventful and a good warm up to the remaining terrain on the hike. We followed the Garfield Trail to the summit of Mount Garfield and down to Garfield Campsite. The summit approach was a bit of a rock scrabble but nothing difficult. New hikers may find it problematic, just take your time. 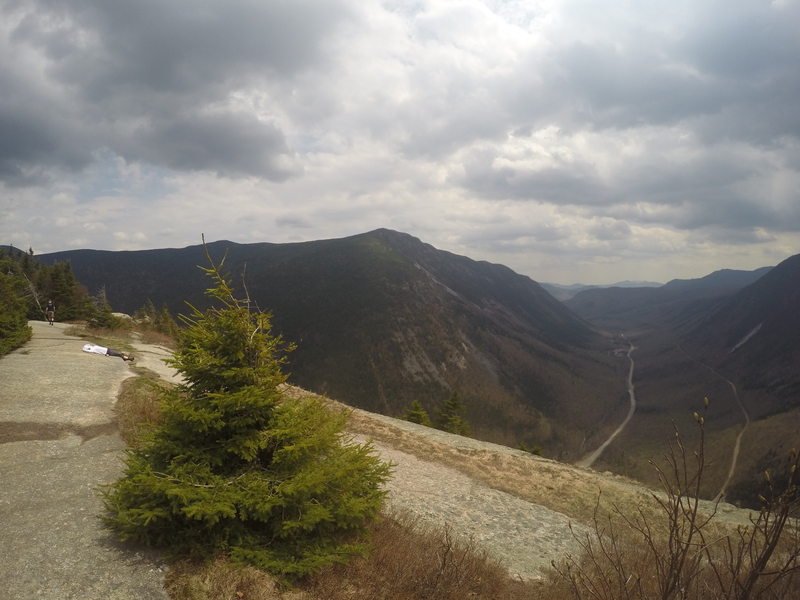 We captured a few images at the path division, one direction leads to Mount Garfield and to the Franconia Ridge, the other direction is a steep rock to rock descent on the Garfield Ridge Trail and to the Garfield Campsite. When we arrived to the campsite, we met with the Caretaker to receive our site location, unpacked before we needed our headlamps to move around the camp. We were placed at campsite #7, which is located on the right edge of the camp. As a note to hikers using campsites — All hikers with two legs are $8, four legs are free, but no shelter is offered to four legs during storms. AMC rules so plan accordingly. A memory plaque for Anne Converse Backus. You will pass this plaque on your left when you approach the campsite. Anyone hiking the Garfield Ridge Trail and happens to need water. This campsite has a water source outside the campgrounds. It is about 8 to 10 steps from the trail junction for the Garfield Campsite & Garfield Ridge Trail. Just follow the sign below to find the water. We had our dinner at the campsite assigned “meal grounds”. It’s just in the center of the campsite with a cook pan. Abby enjoyed her raw diet dinner while we had some leftovers. First day meals and second day morning meals on long hikes are always nice. If you plan smartly, you can freeze your meal and by the time you sit to enjoy it — its unfrozen. 🙂 Abby’s dinner was still a bit frozen, but it is helpful for keeping moisture in her diet. We shared the same side of a rock booth, while the Admiral and Navigator shared the other. The caretaker notified us of bear activity, we followed all rules with food storage, trash and added in our toiletries for good measure. This meant placing all those items into the bear boxes provided to us. Abby’s activity for the day via Tagg, a pet tracker. The night was cool, windy and clear. About 430 in the morning, Abby woke me up. First thing, I thought was, “really you have to use the bathroom this early” and then I heard the activity and felt the impact tremors of a bear or two. I was not up for sticking my head out of the tent to get a firm count on the activity. Since, Abby’s behavior made it clear to us it was not a little raccoon. We maneuvered into position while Abby went into a low guarded position. Minutes later, Abby let out one hell of a deep growl within moments we could hear the outdoor activity moving farther away, the Navigator exited the tent and all as well. Of course, the Admiral was snoring through it all. We headed out of the campsite and refilled our water. Though, it was a cold morning the temperature would be in the upper 70s by mid-day with possible severe thunderstorms in the evening and overnight. This is one reason we love our AMC huts and campsites, it’s a location to receive our weather updates. Albeit in the Whites, it is still best guess 🙂 So, plan for the worst and pray like hell for the best. After refilling our water, we headed down the Garfield Ridge Trail to Galehead Hut. About 1/2 mile into the morning trek, Abby came to a dead stop and looked back with one of her famous WTF looks. When reached her location, we fully understood her look. Our morning plans to leave camp an hour later, so that the clouds were passing over us was worth it. We came to a point where we needed to travel down a ‘waterfall’. Now, it’s not a gushing waterfall, but the climb down is steep. Of course, Abby being wise and small avoided the rocks by traveling through the trees. The Navigator and I made our way down the wet moss-covered rocks while listening to the Admiral talk about rocks, trees, and made sure we very careful. This image does not do the climb down justice, but you get an idea of the terrain. Here is the descent from the campsite to the waterfall and off Garfield. The rest of the trail to Galehead Hut is what we call PUDS, also known as, Pointless Ups and DownS. Most of the ups and downs are on rock facings and some are steep, but not steep enough for a hand over feet climb. Below is one of the easier rock facing climbs, it gives you an idea of the terrain and the puds. There are some rather steep descents, if you take a moment and look around you may find a well-travelled path to your left or right. The path leads around the rock area, it is safer for people with heavier backpacks and easier on your legs. Not all of the trail is rocks. You will stumble across some roots along the way. No pun intended. And there are a few short-lived areas of flat. Always watching – break time. Here is a section of the PUDS hike. The last 0.6 miles to Galehead Hut is a rather steep climb. You can see the incline in the image above. Galehead Hut is located to the right in the image above. As usual, we got the weather updates, refilled our water and made a few friends while hanging out at the hut. Of course, Abby was the center of attention before she just wanted to be left alone and regroup in her corner. We had an early dinner while a few storm clouds passed over and reviewed our plan. The night forecast was a high probability of serve thunderstorms. Our next location to camp was Guyot about 3.5 miles away. A few things about Guyot Campsite. It’s in a rather open area, which means limited tree cover. There are shelters for storms, but dogs are not allowed. From the hut, one will have to summit South Twin, descend South Twin, walk to Mount Guyot, descend part of Mount Guyot and reach the Guyot Campsite. There is a point in the trek where you must commit to the campsite or fall back and camp in the tree line of South Twin. The approach to the campsite is open from Mount Guyot and at times steep. So, plan wisely. We made our plans to attempt to make it to Guyot campsite. We would make a judgment call at the point of total commitment. We collected our gear and we were off. First goal was to tackle the very steep climb of South Twin. It’s a short climb, but very steep. Very steep puts it mildly. During the climb, Abby needed a few supported jumps. One of the jumps was onto a steep rock facing and then onto a huge bolder. We needed to work together to support her on the second jump so she did not fall backwards and made the jump to the second onto boulder without face planting into the next rock only a few inches from the landing on the boulder. We did have to lift her up twice. 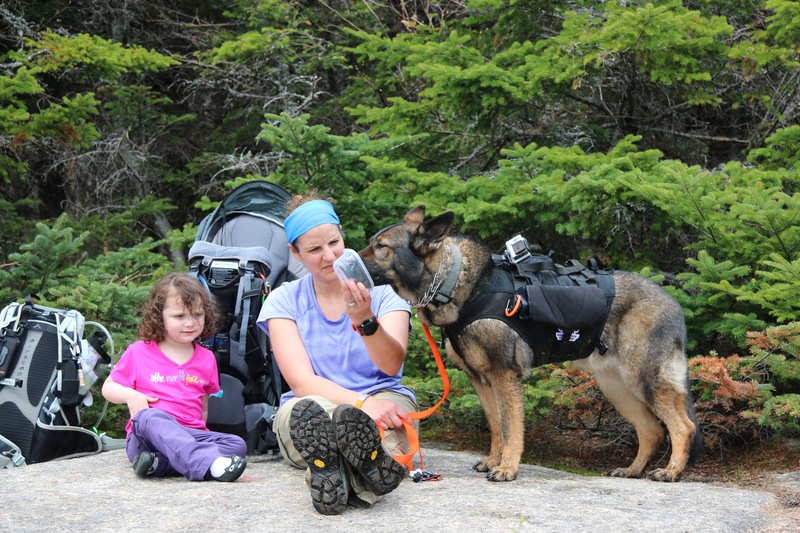 I am grateful she had a very supportive harness that made lifting her very easy and comfortable. It’s a tough climb, but manageable. It’s an easier climb to start a day of hiking rather than end a day of hiking on tried legs. But I am very glad to have climbed up rather than descend it. Here is the climb in two views. The climb is a workout. You will know you are getting to the summit when the terrain changes from big boulders to those pesky little loose rocks. Here are some images looking back out during the climb. Looking back, rain clouds passing by again. The views from the summit are absolutely amazing and very worth the climb. A few notes about South Twin, if you are traveling onto North Twin continue walking straight for roughly 1.2 miles, if you are traveling to Guyot, Bonds, Zealand you need to descend the mountain to the “south by southeast” or from the summit path you just climbed, it is to the right. The above image is the trail sign where you start to descend. It’s a nice gotcha if you are not paying attention. Also, if you are heading up South Twin via Twinway Trail with a child carrier, make sure he/she is secured snugly in the carrier. It will help limit their movement helping you climb without large shifts of weight, especially those going backwards. The descent from South Twin is quick, but a bit steep. Absolutely nothing like the climb up South Twin. You will descend back into the trees and have a nice flattish walk to Mount Guyot. This is a highly camped area, so if you are looking for a campsite there are various places. While you travel along the path, look for well-travelled paths heading off the main trail, most of them are to campsite, just make sure the one you chose to camp at is 200ft from the trail. We broke out of the tree line roughly 2 miles passed the descent. This is the point of the commitment. We took a short break looking out over the area we were to camp and climb the next day. It was beautiful. During the break, we saw an awesome multiple lightning strikes in the distance and rain, we made the decision not to make the commitment and went to our back up plan for the remaining of the hike. We headed back into the tree line to a nice level camp area, we marked as our back up campsite as we walked by it. We made camp, hung our food in case of bears and within 5 minutes of getting settled in the tent we had a nice lighting show and rain for remaining of the night. It was an amazing storm, but I am glad we were fully covered and did not need to retreat to another location. Also, we had no bear visitors that night. Abby did extremely well throughout the day. It was not just a physical workout for her, but a mental test. She followed every command to wait, climb, jump, rest, go (okay to pass and lead), platz (down), plac (crawl), bot (here) and leave it. The below picture is the result of her hard work. She did not even wait for her blanket or removal of her leash before laying down for the night. By the morning, she was all ready to go. In fact, she became the morning supervisor of taking down camp. We felt like she was grading us on time and method. Since, we did not commit to Guyot Campsite, we would not be able to make West Bond, Bond and Bondcliff. The decision was made to keep our family together and safe. It did remove about 6 miles from our total. With that being said, we have planned to make the hike to the Guyot and to the Bonds in the near future to keep Abby’s word of making it there. The fall foliage will hopefully be amazing this time of year. So, check back soon for the post, images and videos. We headed back to Mount Guyot in the morning. The view in the morning was even better with most of the clouds gone and the sun out. It was a good area to take a break. However, the wind was very active. We dealt with 30 mph winds with gusts up 37 mph. A very normal occurrence in the Whites. The path up to Mt Guyot or down to Guyot Campsite is open and a rock to rock pathway. Night travel, rain or high winds can make the path little tough to navigate. Though, its probably very nice place for some snowshoeing. Continue on the path to descend Mt. Guyot and follow the Twinway Trail. It’s a nice trail with some huge boulders that you will need to climb over or work around. Twinway Trail will bring you to the summit of Mount Zealand. The summit to Zealand is a little tricky for about 25 feet, if that. The summit of Zealand is 0.1 miles off the Twinway Trail. There is no views at the summit, but along the cliff there are 360 views. At the summit, you will find numerous Gray Jays/Canadian Jays or Camp Robbers. The latter is a nickname well-earned. The descent of Mount Zealand is quick and easy. First, part is a steep rock facing descent, which is also a great location to take a break and enjoy a snack. Here is where all the views are located. The second part of the descent is a ladder. Nothing like the ladder at Cannon Mountain via Hi-Cannon Trail. It’s just five steps and not so steep. I will train Abby to at least look while spotting. However, she is waiting for the command to move. After the descent of Zealand, you will remain dropping elevation until you reach the Zealand Falls Hut. You will know when you are close to the hut when you start hearing the Zealand Falls. It’s a beautiful little area and during the summer months packed with people. There are a few pools water. Abby went to cool off. Though, I was glad she went to clean off the mud. It is also, a great location to give your feet a quick spa treatment. Though, I suggest first removing your boots and socks. The Zealand Falls Hut is rather popular because of its easy hike to the Hut and has easy water access. We enjoyed some nice hot beef and barley soup and instant coffee while we relaxed a bit before heading on to our next campsite. Of course, we got the weather report before we left. Again, the forecast was thunderstorms at night. The storms seemed to be following us and a theme song to the nights during this hike. We climbed down a short descent, roughly 750 feet, from Zealand Falls Hut. There is a nice water spot for lunch, break or to avoid some of the hut traffic. We continued to follow the Zealand Trail. The Zealand pond is very beautiful and a great location to maybe see a moose or two during the off-season of the hut. Here is my view from the bridge and pond images above. We hiked to the A-Z Trail junction and took the trail leading up to Mount Tom Spur. It is a 2.8 miles trek easy with a moderate areas. Our goal was to make it to the campsite location before the storm hit. Unfortunately, we made it about a mile before we felt the first few raindrops. We managed to get the Admiral covered, rain covers on the packs and electronics safely stored out of the rain before it started pouring. When I say pouring, I mean it. It was the type of rain that causes puddles in a few minutes and when you are traveling up hill, there is a small river of water traveling down. Your quick dry pants are just soaked in minutes. That type of pouring rain, the deluge type. The storm ended up cutting our day light short, which meant we were rocking headlamps up to Mount Tom Spur area. The A-Z Trail is truly a hike in the woods. You will face different terrain in a heavily dense trees and bushes. 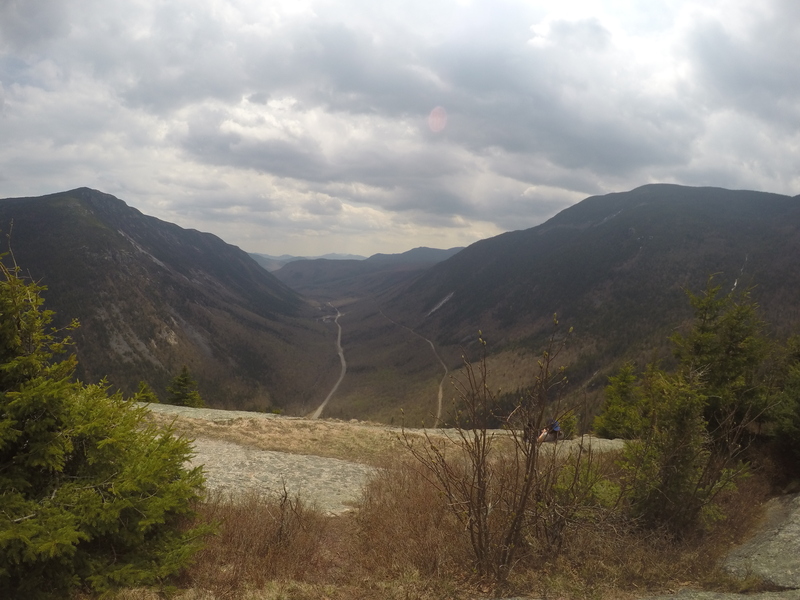 Not many people travel the path even though it is a cut over to the Presidential Range. Most people travel via the Ethan Pond Trail. That being said, keep you eye out for yellow trail markers it easy to lose the trail if you are not paying attention and you will see numerous trees with bear markings. No worries, no attacks have occurred. It’s normal you are in their territory after all. Abby enjoyed the rain as a way to cool off. She led the way last the 0.2 miles to the campsite. The red lights attached to Abby’s harness were extremely helpful this evening and night. We removed her packs and placed them into our packs to protect them from getting wet. By the grace of the Mountain Gods, the rain stopped for roughly the last half mile to the campsite location and throughout camp set up. With all the bear markings, we hung our food and other items a little farther than usual. We got all settled in before the rain restarted and the thunder came. In the morning, we pack up camp while our supervisor decided we could manage without the watchful eye. 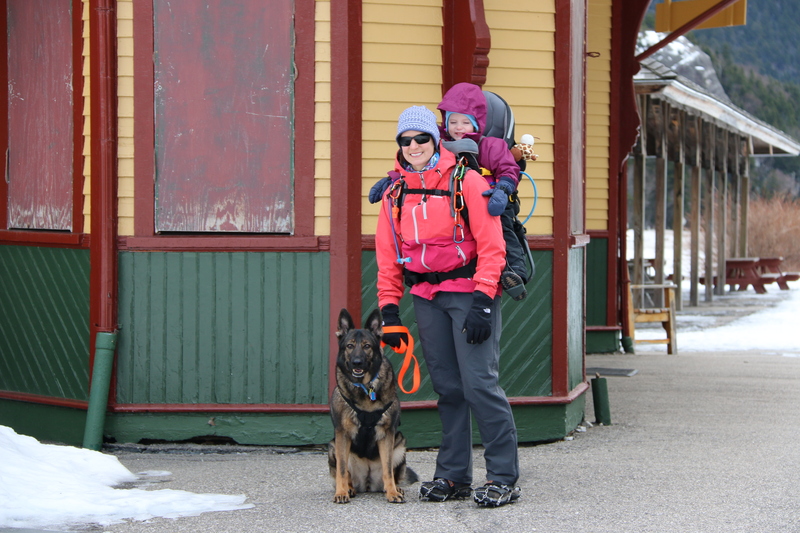 We followed the A-Z Trail to the Avalon Trail and out to Crawford’s Depot. We could not have been more happy to see the Highland Center. For a few reasons, first and most important real bathrooms, cooked food, cold drinks and a chance to do a wash down. There is nothing like a good hand and face wash after a few days in the woods. Plus, our car was close by with a stash of goodies, clean clothes and a chance to unload items we no longer needed. We lived a lavish life for a few hours before making our way to our final campsite in a light rain. Our final campsite was off the Jewell Trail. A trail we have travelled numerous times to the summit of Mount Washington. Our original plan was to camp at the Mizpah tentsite. The weather report of rain throughout the night and morning, we decided to travel on a trail that was covered for half the hike up to Mount Washington. We did this for a few reasons. Once, we left the Mizpah tentsite we would have to travel about 7 miles above tree line in what was projected to be in the clouds and rain. Shelters nor huts allow dogs. Lake in the Clouds Hut would be available for water and some food, but no shelter, if needed. Basically, there was no areas for safety. The morning of September 11th, we were in the clouds with light rain. The visibility was limited but manageable. We made it to the summit in the latter morning, of course the summit was usual in the clouds. The Cog Railroad, sorry no dogs allowed. Overall, it was a great hike. We enjoyed our time on the trails and all the hikers we met along the way. We made tough calls to make sure we were all kept safe. Our original plans had to be modified, but it happens. We worked together as a team to get through some tough areas. We had numerous laughs along the way. And made memories that will be carried with us for a lifetime. We did it all while supporting a great organization, Warrior Dog Foundation. Please, visit our store to purchase the Hike for K9 Heroes Hoo-Rag Bandana. 100% of the proceeds to directly to the Warrior Dog Foundation. 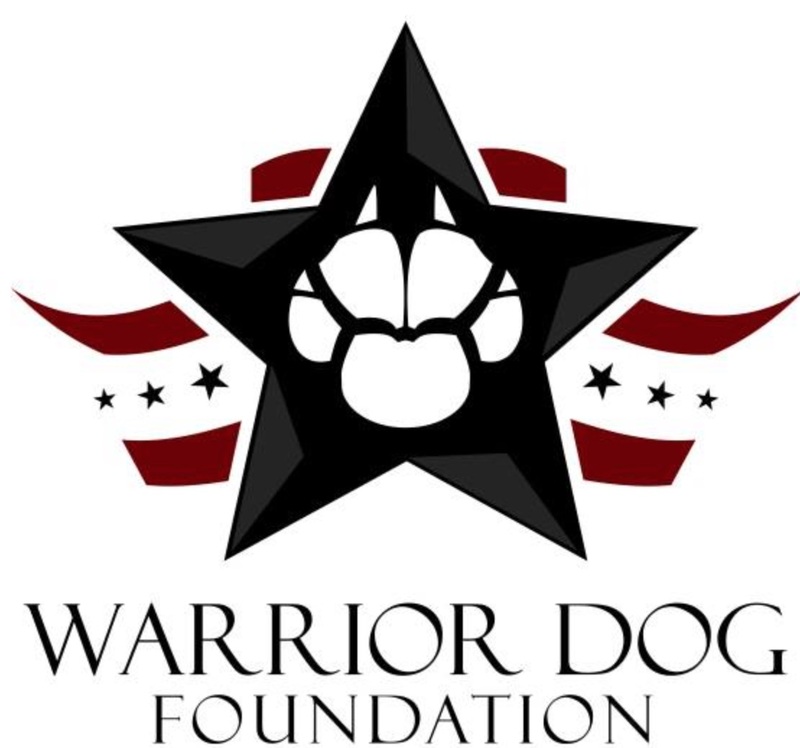 To learn more about the Warrior Dog Foundation, visit their site, here. Mount Waumbeck is location in Lancaster, Jefferson, Coos County, New Hampshire. Jefferson is a very pretty town. If you can, I highly suggest adding some time here to stop by the museum and statue. Mount Waumbeck is part of the 48 4,000 footers in New Hampshire. Learn more about Waumbeck. There are a few ways to access this peak. We took the shortest route via Starr King Trail. It is direct and to the point, but do not take that lightly, after all you are hiking in the White Mountains. Starr King Trail is located off of Starr King Road in Jefferson, NH. Starr King Road is off of Cottage Road accessed via Route 2. Map of location. Starr King Trail to the summit of Starr King is 2.6 miles. The hike is at incline, but gradual with a handful switchbacks. The terrain is very easy for the White Mountains. At the 1/4 mile into the ascent or so, you will pass a well. This is a good land-marker for your descent if you plan to return the same way. Starr King is a good location to stop, rest and have lunch. Of course, the Admiral chatted through the whole break. The trail to Mount Waumbeck from Star King is roughly 1.1 miles. The ridge walk is rather flat and very straight forward. The summit of Mount Waumbeck is below tree-line, but it a very nice walk on what could be a rainy day. The rain came shortly after our summit of Mount Waumbeck. It made the descent somewhat slippery, but manageable. Though, in a downpour the trail could get really muddy and the moss very slippery rather quickly. Mount Osceola is a 4,315-foot peak, located in the White Mountain National Forest, New Hampshire. Mount Osceola is named for the early-19th century Seminole leader. There are two ways to reach the summit of Mount Osceola. One is from Greeley Pond Trail to the northeast of the mountain, which requires crossing the East Peak of Osceola first or from Tripoli Road to the south. We took the southern ascent via the Mount Osceola trail, which is a 3.2 mile/5k trek to the top, 6.2 mile/10k round trip. 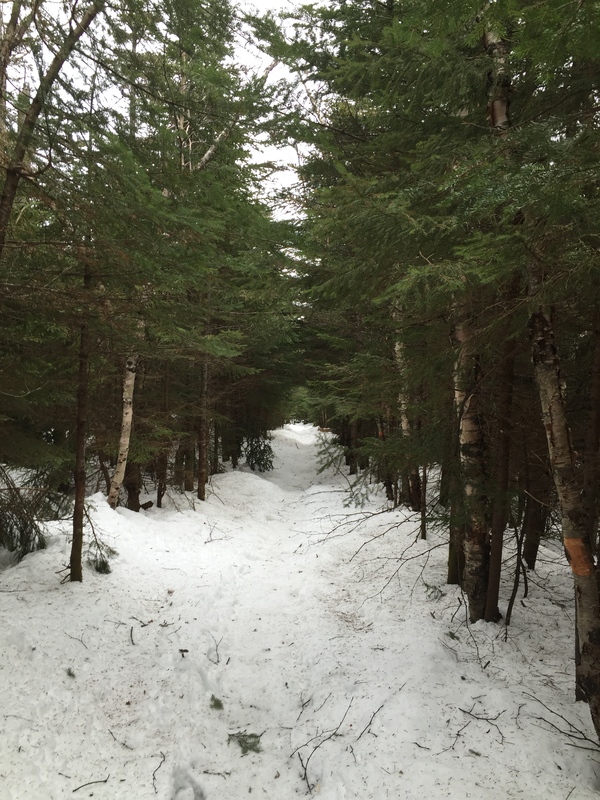 The trailhead is off of Tripoli Road in Waterville Valley, NH. You can access the road off I-93 exit 31. *Note: this road is closed from November to May* Travel roughly 6.7 miles on Tripoli Rd to the trailhead. The trailhead is located on the left with parking. *There is a fee for parking for those that do not have a yearly parking pass.*. Tripoli road is paved then becomes a gravel a few miles into the woods. You will pass various camping grounds during the summer it is rather busy so be cautious. The trail is one of the easiest we have done. 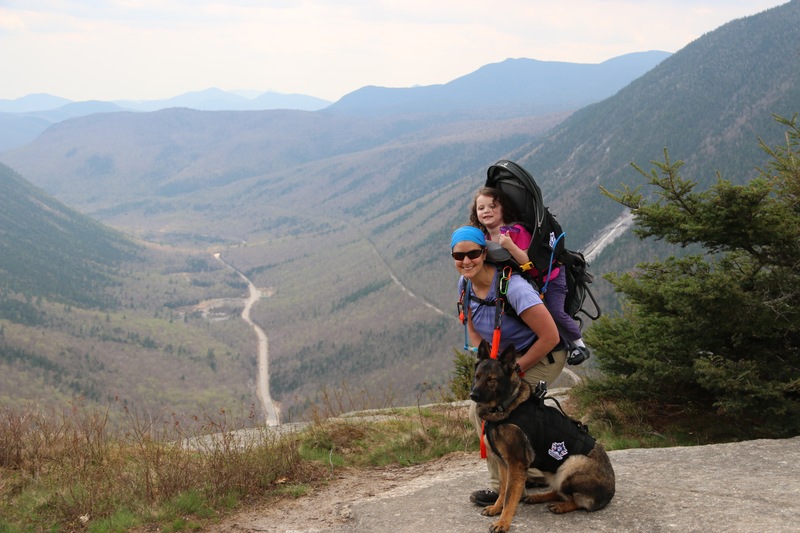 There were not many areas that would be problematic for a family hiking with a child. 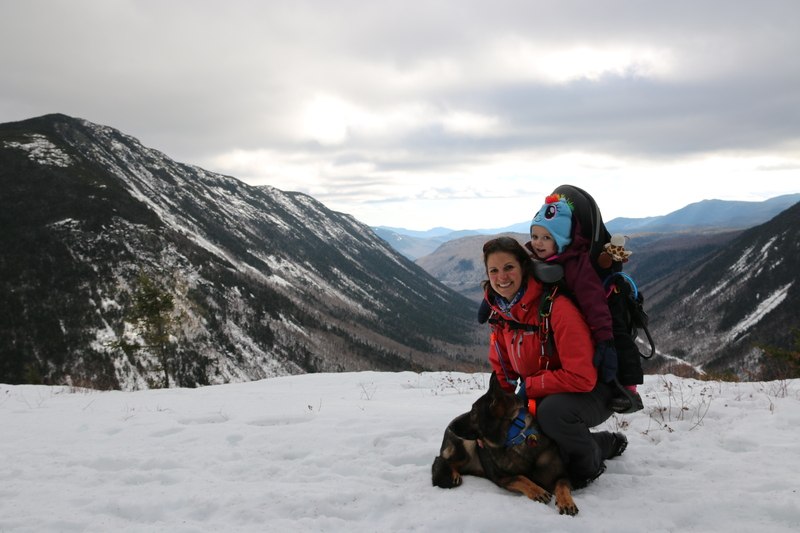 It is a far cry from the ‘death match’ hike of Mount Carrigain, via Signal Ridge Trail. There are a few areas near the summit that you will enjoy a few views and good breezes. In addition, compared to Mount Carrigain the trail path is not so rocky and a good 3 feet wider in certain areas, which is helpful when allowing people to pass. Here are some images along the trail to the summit. Our objective with this hike was to train Abby, our rescue canine. This trail is busy, very busy with people and dogs. The climb is rather easy but all the traffic of people and dogs is a great way to solidify training. There were “reactive” dogs on the trail, which was very helpful for training and a few people who were terrified of dogs. As I said, the trail is very busy and wide, which is great for real life training. The trail is rather straight forward, a basic up and back with a few switch backs to keep the incline easy to handle. Some part of the trail are under reconstruction, but there are no hurdles to worry about. As you approach the summit, you will face some rock facings. A few of the facings the incline is rather step and can be very hazardous when wet. You can either go hand over feet or work your way along the side and up. I highly suggest to plan accordingly. As you approach the summit there is a path to your left, climb up the rock and look out. You will be able to see Mount Washington and the Presidential’s on a clear day. Double back and take the path to the summit. The path to the right on your approach leads you to summit, too. We suggest skipping that path the approach from the path straight ahead is way better. We were not able to find the summit marker for this mountain, but normally with fire tower mountains, we have found there are no summit markers. If you are looking for an easy up and down with beautiful views this is your mountain. 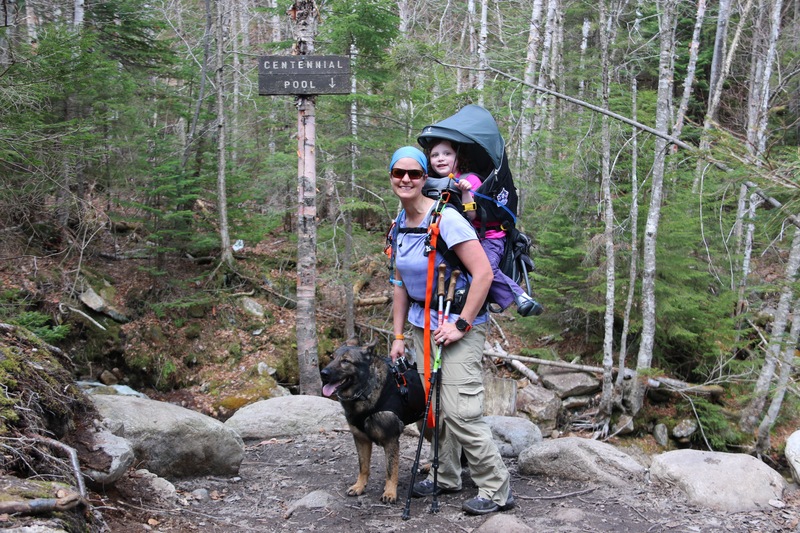 If you are hiking with kids it is definitely something you can do as a family and if you are traveling with a child on your back, it’s a walk in the park compared to other White Mountain trails. As usual, please remember to leave no trace especially in areas where bears are more prone. Safety first. 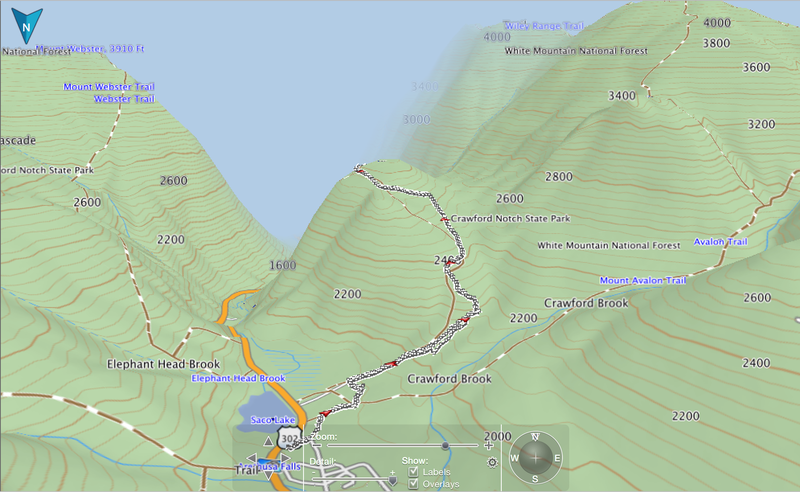 Lastly, here is the 3D map of our hike. 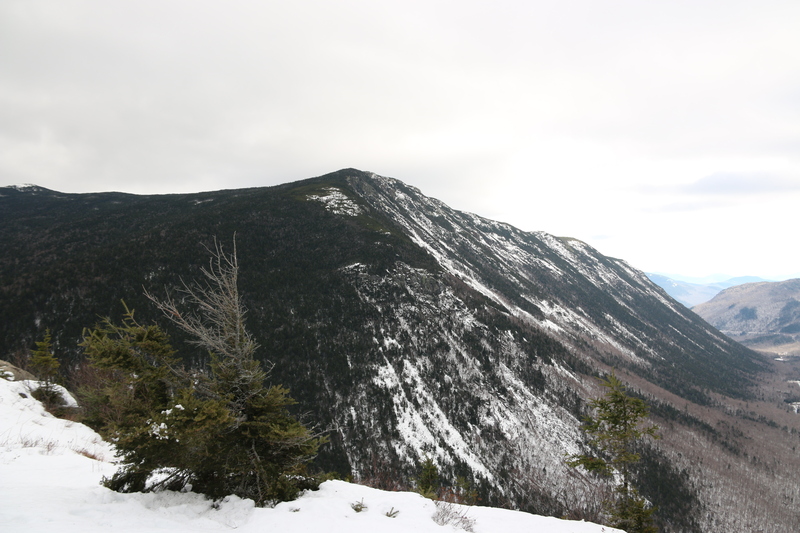 Mount Carrigain is part of the 4,000 footers in New Hampshire. Mount Carrigain is located Grafton County, NH. The mountain is named after Phillip Carrigain, NH Secretary of State (1805–10), and is on the south side of the Pemigewasset Wilderness. There are two main paths to the summit. 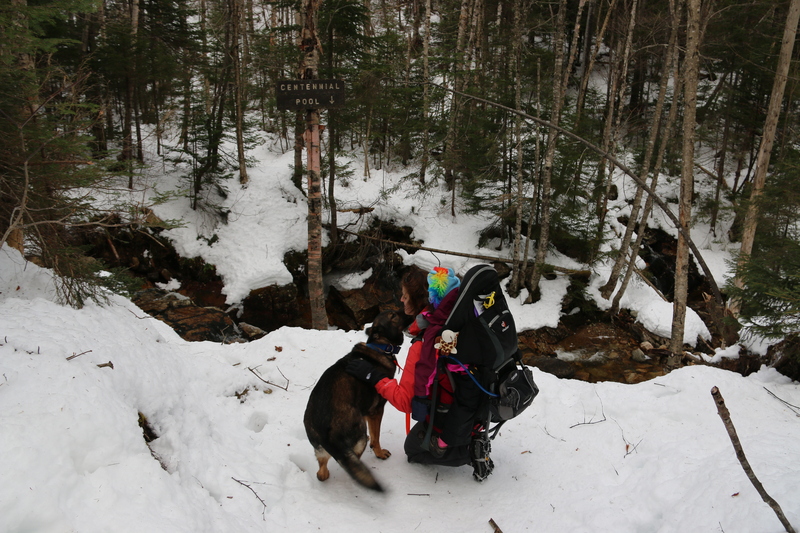 Desolation trail, which is steeper can be accessed by Carrigain Notch Trail, Nancy Pond Trail and a few other trails. The other option is Signal Ridge Trail, not as steep but still a rough terrain with a steep incline. Signal Ridge Trail can be accessed by Sawyer River Road off of Route 302. *Note: Sawyer River Road is closed during the winter months* We took Signal Ridge Trail, which can be found two miles from turning onto Sawyer River Road from Route 302. The trail is on the right just after a bridge with the parking on the left. In the parking lot area you will see this gem of a tree. Note: The trailhead sign misspells “Carrigan”. AMC Link From the trailhead to the junction the trail is rather easy and a pleasant walk minus the mosquitoes. I suggest bringing some repellent. We allowed M to walk some of trail at the beginning because it was that easy. About 1.5 miles into the hike you will have to cross the river. At the beginning of the spring season this crossing could be extremely difficult or impassable. After the river crossing, you have about 0.2 miles to the junction. You will cross some log bog bridges heading to the junction. 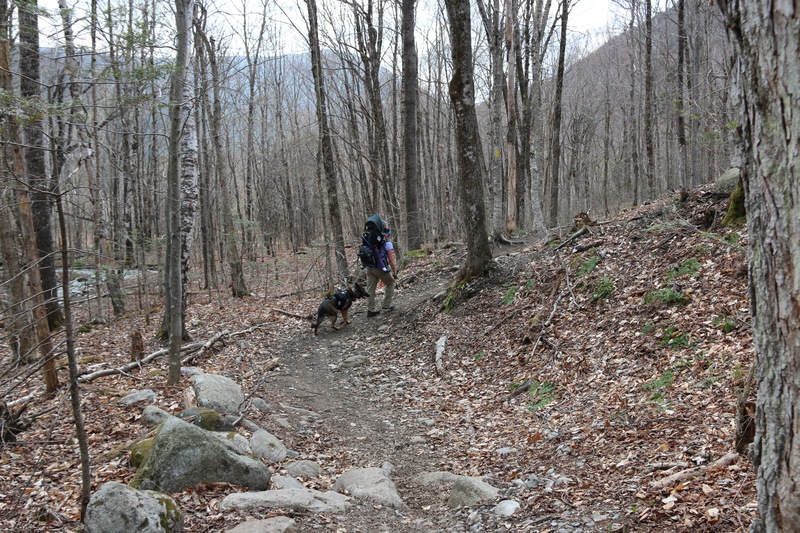 At this junction you can either head left to continue Signal Ridge trail or head straight on Carrigain Notch trail. We went left, on Signal Ridge trail and shortly into trail is where the terrain became harder. From the junction, it is 3.3 miles to the summit of Mount Carrigain. The trail offers nothing exciting other than incline and rocks. In some ways, it feels like you are on a ‘death march’ to the summit. But, do not worry the views at the top are amazing and even more amazing on a clear day. If you hike this trail during rain or after take your time with the climb some careful footing is needed especially when the rocks are wet. There is a section of this hike that is pure rock; not large rocks, but those pesky little rocks. Watch your footing, especially on descend. Here is a small ‘rock climb’ you will face. It’s rather easy, but with larger backpacks or a small child on your back it will take some maneuvering. Though, there is really no views or excitement to the summit. There are locations were you get what our family “sarcasm” calls “outdoor a/c”. In other words, you will hit areas, where a nice breeze with come through. Of course, that is more towards the ridge line and summit, but on hot days like our hike, we are thankful for what we are given. You will reach the Signal Ridge at the 4.5 mile marker. You will know its the ridge because straight ahead of you about a half mile away is the summit of Mount Carrigain and the fire tower, to your left you will be some shrubs and trees and to your right you will see the Presidential Range, Attitash Mountain and on a clear day into Maine. The ridge is a great place to take a moment, rest and regroup. The trip up to the summit is short and after your ‘death march’ climb, its really nothing. But remember what goes up must go down. Here are some images from the ridge and summit. Here are some terrain images by our GPS device. These are after the junction post approaching the ridge and summit. Over all this is a great hike. It is a workout, but well worth all of it. Mount Carrigain in our books, lives up to its name of one of the most un- respected climbs and views of the White Mountains. Hiking season has officially begun! And we are excited to finally hit the trails. We decided to start with an easy hike and get back into the swing of things. We did a repeat hike, Mt. Willard. We know the terrain and what to expect. Instead of repeating myself, you can find more about Mt. Willard, here, and the trail details. 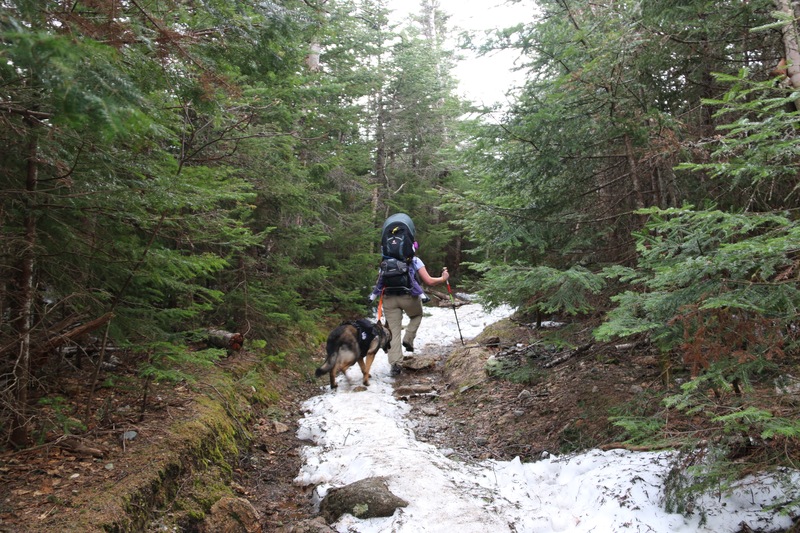 However, for those hiking the trails, the current conditions range from dry, wet, mud, snow and ice. You get them all on this hike. So, be careful. You could use micro-spikes, if you want, towards the summit. We didn’t have them. We walked on the side of the trail and avoided the ice. If it stays warm, all the snow and ice should be gone in about two weeks. Of course, that means mud and tons of it. Also, the water crossing may be a little tricky. Here are some images from our hike. Water crossing while M took a nap. 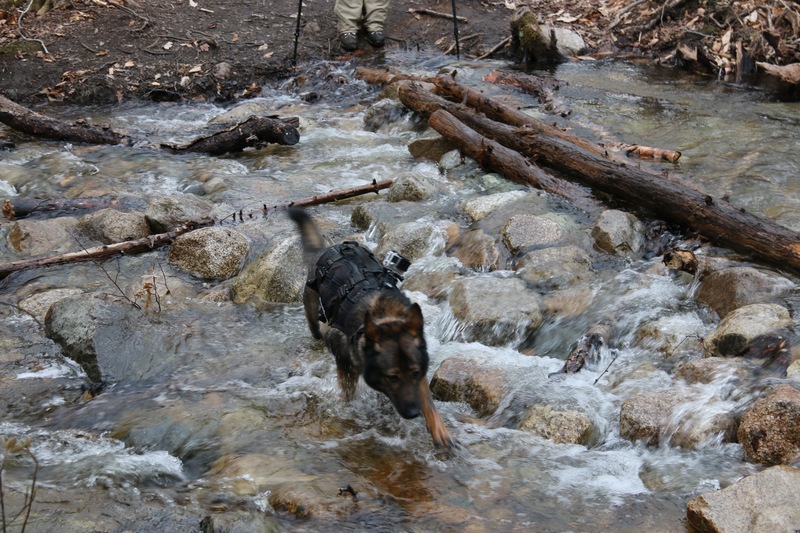 Abby’s way of crossing the stream. At the summit, staying hydrated and taking a break. Summit photo before heading down. For the first hike of the season this is a great trail. It was rather busy, if you want more solitude, I suggest skipping this trail. This summer one of our family members will be hiking across the White Mountains to raise money for a wonderful nonprofit organization. 2014 is done, you can’t change what happened, the ‘what ifs’, the ‘could ofs’ and ‘should ofs’ will not help you move forward. Learn from what 2014 and “let it go”. Make room for 2015 and make it the best, apply what you learned in your life. We couldn’t have made a new life with Abby, a home for her, if we dwelled on everything she did wrong and if we dwelled on how we failed Abby. Yes, the shoes were a tough thing to swallow, but we did. However Abby found it relatively easy, eating 3 pairs of my Husband’s sandals (HaHa). We learned to make a difference and make a change for success. Today, we can leave shoes around and Abby will not touch them. It took work, lots of repetition and hard work. End of the year is here, if you can, want to or need to keep Uncle Sam at bay. Please, donate to one or both of my favorite nonprofit organizations. I have no ties to either. I support them for the work they do and I believe in what they do. 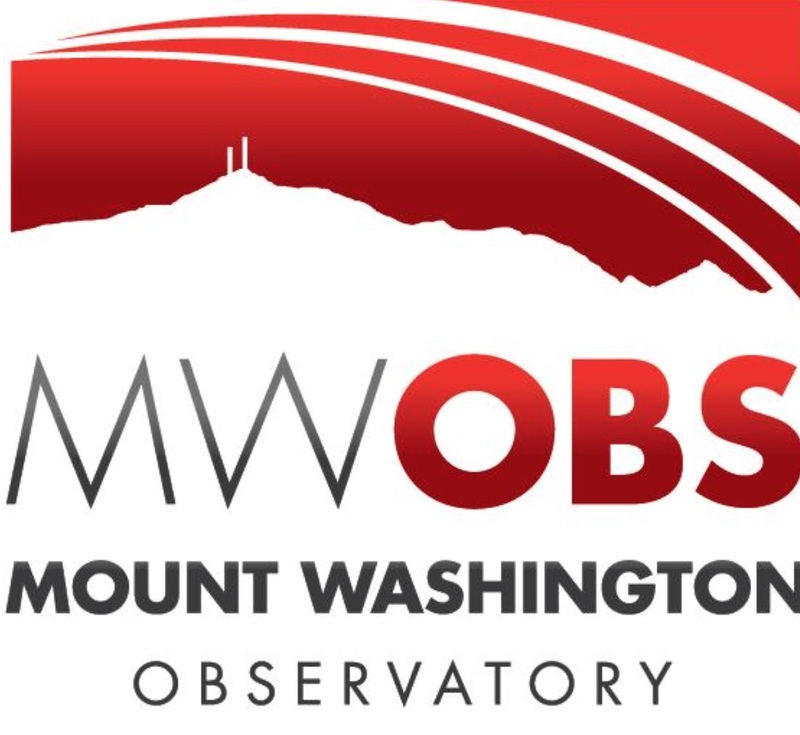 MWOBS studies the weather and does many climate research projects to help give us warning of storms which helps protect what we love. Mt. Washington is known for the worst weather in the world with winds reaching 231 mph. Find out more at http://www.mtwashington.org, here. Warrior Dog Foundation, is a home for SFO (Special Forces Operation) dogs. They help find a dog home after their service or injury. They work directly with the dog, house them, give them whatever care and training needed. They do all this with the honor the dog deserves. They provide a permanent home for dogs that cannot make the transition. Find out more at http://www.warriordogfoundation.org, here. If you can’t donate, help spread the word. We did some training with Abby. Her training was very basic and easy for her, but she is the dog that needs the metal and physical workout on a daily basis. We trained then she got her playtime. Mt. Willard is a very easy up and down with an amazing view at the summit. The best time to hike this mountain is during the fall to capture the fall foliage. Mt. 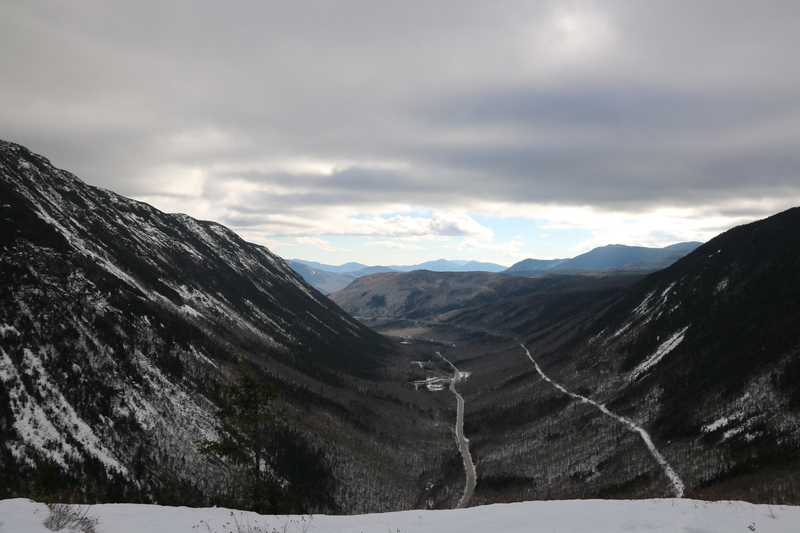 Willard Trail is located in the Crawford Notch State Park. The trailhead is located in the same location as that of Avalon Trail, but instead of going straight, you would take a slight left onto Mt. Willard Trail. Since, we hiked Mt. Tom via Avalon Trail it was very easy to locate. The trailhead for this hike starts at the Crawford Depot/Visitor Center on Rt. 302, just before the AMC Highland Center. Anytime we hike in this area, we stop off at the Highland Center to get trail reports and if needed to sign in and out of the hiker log. Here is the trail from the north view. Our total trip was 4.1 miles from our location at the highland center to the summit and back. 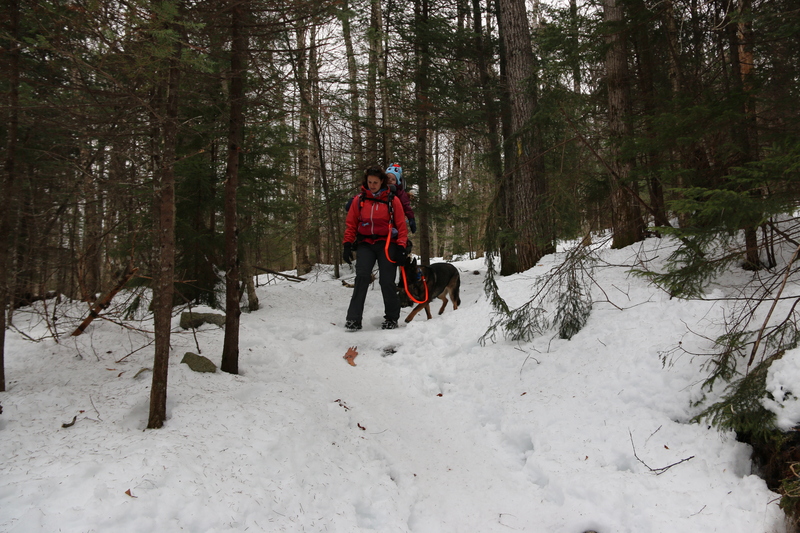 The trail condition for us was packed snow and easy water crossings. If you are hiking this trail during the winter, I suggest running into the Highland Center and speak with the AMC folks at the desk. 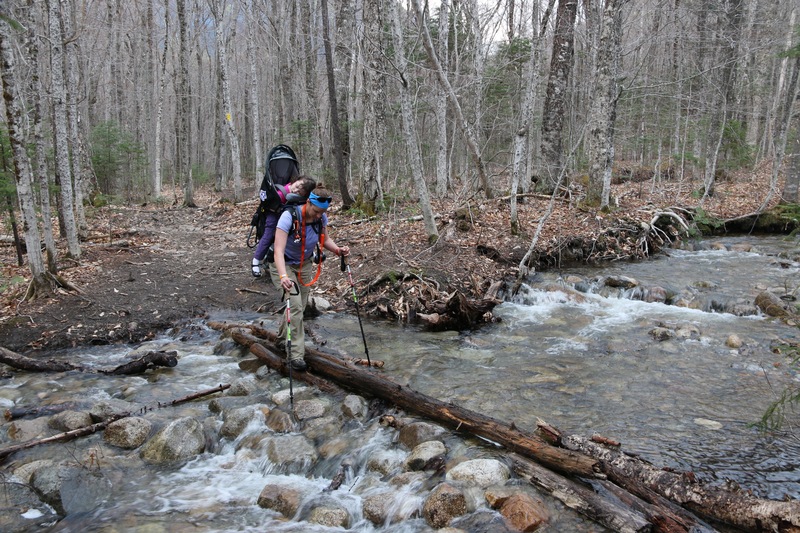 Depending on what the weather was before your hike day, water crossings can be hard to pass or not passable at all. There are a few areas of the trail where you will have to duck under or walk around some broken or snow pushed branches. These areas of ‘obstacles’ are very easy to walk around. We used our micro-spikes for this climb. 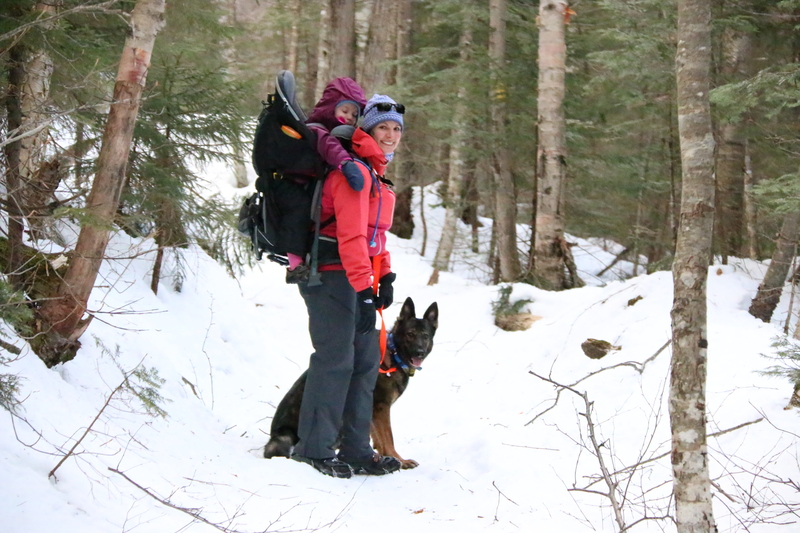 It is an easy hike on packed snow, but with a moving toddler on your back its helpful to have some grip to the earth. The climb and descent are very straight forward and rather uneventful. Here are some images from the trail. As you can see, we added another family member to our hiking team. This was Abby’s first formal hike and she did very well. It was a little confusing in the beginning since we forgot her gear. The gear is key in helping Abby understand it’s time for ‘work’. She stayed on her lead the whole trip connected to my pack and loved every moment. Our goal is to have Abby completely condition and trained for longer and harder climbs by this spring where she will join us on each hike.